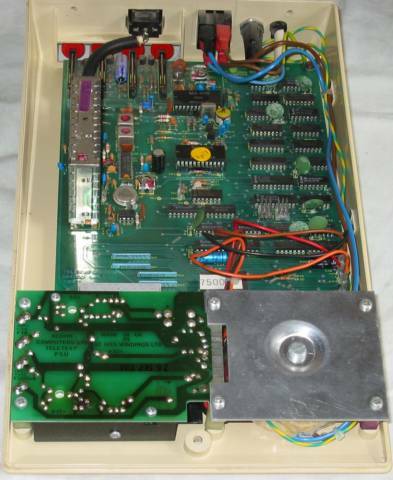 The Acorn Teletext Adapter is housed in a classic Acorn "cheese wedge" box. 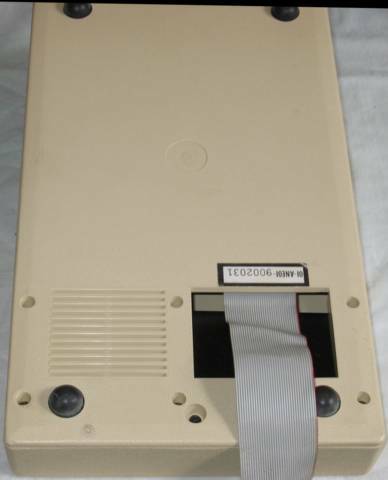 The back of the Teletext Adapter shows the socket for the TV aerial and the red tuning wheels for four channels. The serial number is 01-ANE01-9002031. 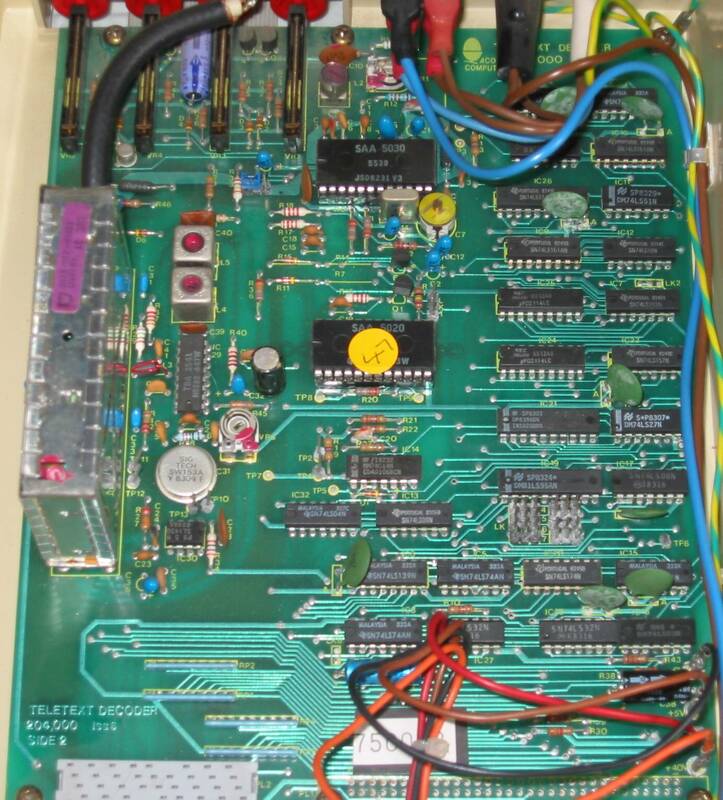 The ribbon cable connects to the BBC Micros 1MHz Bus. Here is a HiRes picture of the Acorn ANE01 Teletext Adapter circuit board . 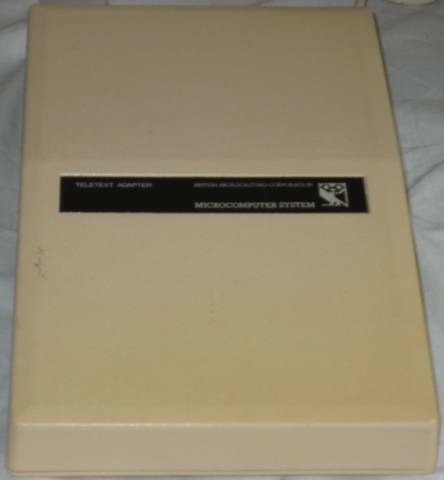 Here is the Acorn Teletext Adapter User Guide . In 1986 BBCSoft produced the Advanced Teletext System which replaced the Acorn ROM, here is the Advanced Teletext System User Guide . 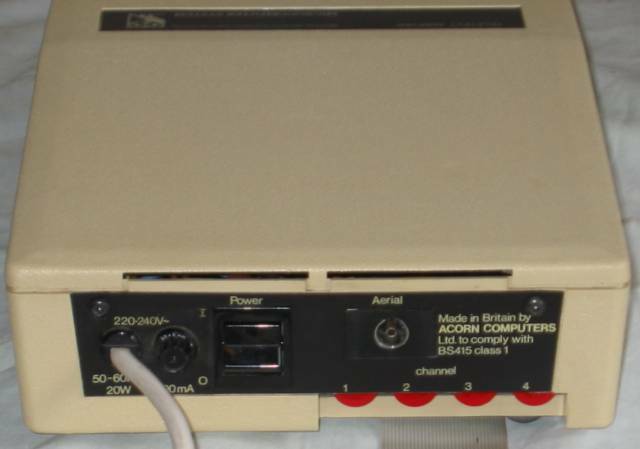 The Acorn Teletext Adapter receives its signal from a TV aerial and connects to the BBC Micro via the 1MHz Bus. The BBC Micro must have a Teletext ROM installed. Teletext is a system used to broadcast text using spare lines in a TV signal (see Wikipedia for a history of Teletext). When the BBC Micro was launched, the BBC also used Teletext to broadcast software for people to download. When the UK digital switchover results in the Analogue TV service being turned off, it will no longer be a broadcast Teletext service in the UK and the Teletext Adapter will cease to be useful.